For my project, I wanted to make something with a futuristic aesthetic. I wasn’t sure what kind of dynamic project I wanted to work on and got fixated on this idea that the whole project had to move. Then I realized that it just had to have dynamic components. That is when I though about making some sort of clock. For the futuristic look, the idea that came to mind was an infinite mirror. These add a really cool affect to a simple strip of LEDs. What I like most about them is that they are also very sleek and simple, which in my opinion adds to the aesthetic. My idea is to take the infinite mirror and make a clock out of it by programming the LEDs to light up in specific ways in which one LED represents the seconds, one represents the minutes, and the third represents the hours. This can be done with an arduino, and I could have the remaining LEDs perform some sort of light show in the background. The clock consists of a regular mirror and one way mirror. LEDs are placed between the two. The reflective side of the one way mirror is facing inward towards regular mirror. The clock will be 1.5’ X 1.5’ with 6” borders. 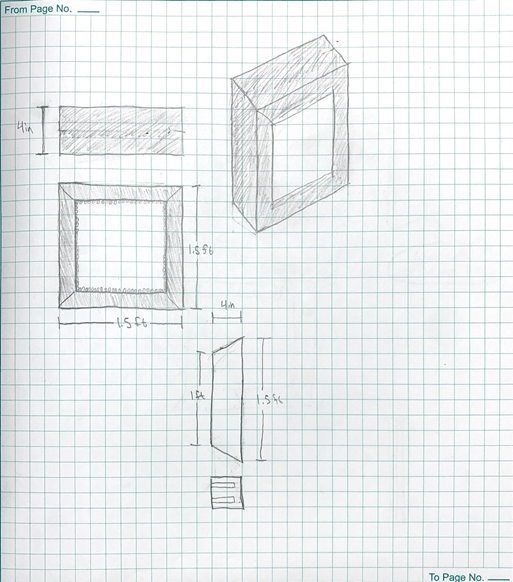 It will be enclosed by a frame consisting of 4 pieces with slots on the inner surfaces. The clock will be 4″ thick, but this may change. It just needs to stand by itself, but I want it to be as compact as possible to add to the simplistic, sleek aesthetic. 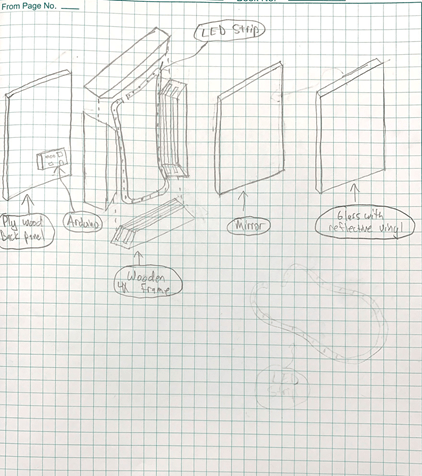 The materials needed will be a mirror, glass pane, some reflective film, an LED strip, an Arduino, black paint, wood, a ply wood panel, wood glue, and wooden dowels. The glass pane will be inserted into the front slot with the reflective side facing inward. The mirror will be inserted into the other slot. The LED strip lights will be glued between the slots after that region is painted black. Then, the Arduino will be connected to the lights and programmed to run a clock. The Arduino will be attached to the wood panel which will attach to the frame behind the mirror. Lastly, the frame will be held together with glue and dowels. My biggest constraints are time, compactness, the frame, and keeping the aesthetic. The frame will be time consuming because I must work with the availability of the wood shop at the Idea Forge. Putting slots in the frame and getting all the cuts right will be critical. I would like for the wiring and electrical components to be very well hidden and for the clock to be relatively thin. In order to achieve a futuristic, sleek look, I must take each step with great care and allow myself plenty of time to adjust things, mess up, rebuild, etc. I really like your idea for this project. I like how you used previous projects as inspiration but then you added your own twist to make it original. Connecting all the LEDs and programming them correctly to work with your clock maybe a bit difficult, but there are plenty of resources in the ITLL that can help. I’m excited to see your final result! Hello, I really like your idea. You did a great job of incorporating your aesthetic into your design. Great job! This is super cool! I might make one for myself. How do you plan on powering this? Good question! I am probably going to use a 12 volt batter considering the LEDs will not require much power. This is a really interesting idea. The light show makes this project really unique and adds an extra dimension to an already cool clock. This is a pretty fascinating idea. This could look so cool at the end if everything goes as planned. I think you have a pretty good idea of the materials and process needed to complete this project. I am excited to see your final product. Infinity mirrors are really cool. I love the illusion. Your plan of construction and constraints were well thought out. I like this idea. I think a dark border will make the LEDs the main part of the aesthetic.